Menthol + camphor = instant nasal-clearing relief. Not being able to breathe, while your head feels like a balloon, is misery. 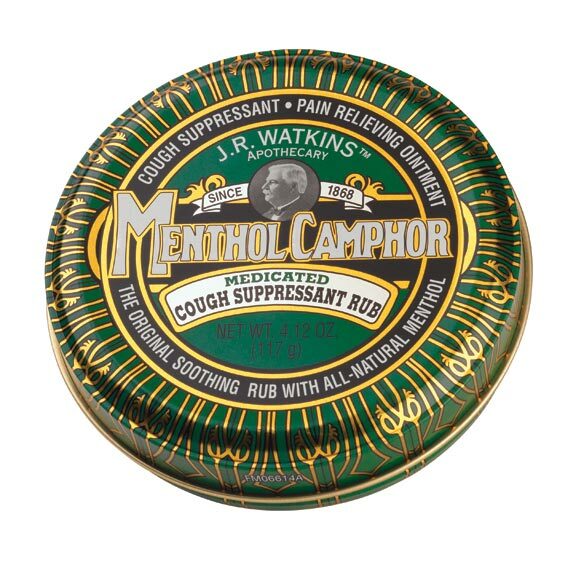 Watkins™ menthol camphor ointment offers cool relief for the stuffed-up, congested, don't-want-to-get-up feeling. Rub onto chest and throat. Menthol, plus camphor, extracted from evergreen, helps restore easy breathing. Contains 4.125 oz. We apologize for any inconvenience; however, this item is not available for shipment to Canada. Camphor (5.3%) (Analgesic, Antitussive), Menthol (2.8%) (Analgesic, Antitussive). Watkins suggests use on chest for colds,etc. I used it on my lower back. Seemed to sooth the soreness somewhat. Smells great! it is the bomb diggity!!!!!!! gma used it; mom used it; i cant live without it when i am sick.. i'm a nurse and i recommend it to ANYONE!!! At the first sign of a cold or clogged sinuses, put some under your nose, across forehead & on the throat. It quickly helps you breathe. I rub a small amount on the soles of my feet, then put on warm socks and the coughing stops within a very few minutes. It can be used as often as necessary. The smell is not overpowering. this is good for dry lips and as a chest rub to help with congestion. I trust the Watkins products for a long time and i know this products works. I found this product in your catalogue. My mom used this product for all cold related symtoms. Much more menthol than the store brand that starts with a "V." Best menthol-camphor ointment on the market! I love this stuff! Have used in the past. Makes one breathe clearer and feel good. my husband loves it and I couldn't find it in stores. The best product to control cough and congestion. it works great and my family keeps taking mine cause it works so good. Better then any over the counter product. I'll try anything that will help to comfort the cold. My mother used this on us when we were kids. This is the only thing that helps the cough I get when I have sinus problems. I rub it on the soles of my feet and put on warm socks and the coughing immediately stops. I grew up with my Grandfather selling Watkins Products & my Mom always used this on us. Have used this for years and it has many uses. My dad got me started. To help me and the grand kids during cold season..
To relieve nighttime sinus pressure/pain. We have been using this product for years. It's wonderful. I ordered it for myself, our daughter and grandson. It last a long time and it works!! no account necessary and no recurring orders. have used it for many years and finally found a place where I can order it. My grandmother use to have this in her house for emergencies. Great experience using this item. what makes it better than vicks vapor rub? BEST ANSWER: I use it for cold sores , small cuts and burns etc. It is good for many things Vicks can't be used for. I am 86 years and will always choose it first. This ointment is slightly stronger then Vicks, I feel like it losens up the congestion in my chest. It is not as greasy and has a pleasant smell.